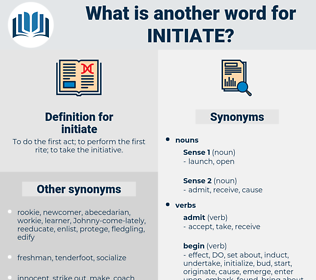 What is another word for initiate? To do the first act; to perform the first rite; to take the initiative. Kicks, begins, members, choices, undertake, starts, launching, starting, implements, initiation. Embarked, commissioned, Carried, Threw, built, Went, made, Undertook, undertake. Originated, trigger, incur, undertake, hurl. 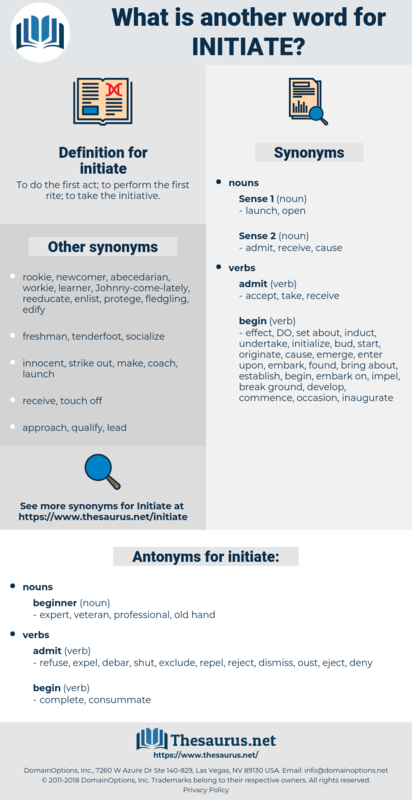 instigate, lay, inaugurate, embark, trigger, stimulate, ignite, incur, spark, operationalize, jump-start, induce, precipitate, undertake, investigate, reactivate, invite, restart, Boots, propose, incorporate, usher, expedite, educate, provoke, pave, unleash, actuate, Enacted, incite, file, instruct, obligate, relaunch, facilitate, accelerate, legislate, execute, entail, jumpstart, reinvigorate, employ, solicit, participate, spur, motivate, appoint, deploy, bind, nominate, arouse, awaken, lodge, mobilize, recruit, advocate, enlist, instil, evoke. expert, veteran, professional, old hand. refuse, expel, debar, shut, exclude, repel, reject, dismiss, oust, eject, deny. terminate, close, ignore, conclude, finish, neglect, end. annul, uninitiate, fire, muster out, annihilate, abolish, halt, can, wrap up, discharge, round, nullify, phase out. Can I initiate myself with a laugh into the ambassador's part, if indeed diplomacy is as difficult as life? To initiate appreciation does not mean that one necessarily gives way to mirth, though even that is sometimes natural and effective; one merely feels the approach of the humorous climax, and subtly suggests to the hearers that it will soon be " time to laugh." establish, actuate, stage, activate, attempt, trigger off, set off, found, undertake, set, plant, introduce, go back, date from, lead up, constitute, arrange, spark, strike up, institute, spark off, trigger, mount, trip, innovate, date back, touch off, organize, initiate, get up, organise, machinate, devise, set about, prepare.